Technology is meant to make our lives easier and more comfortable, isn’t it? And when we speak about comfort, it is hard not to think about the bathroom, which, by the way, is called the comfort room in some parts of the world. With the right lighting, hot water, and a nice deep tub, it is easy enough to see how a bathroom can give all the comforts one yearns for. And with all the high tech bathtubs you can find today, the dream bathroom is not far from reality. Enter some of the most high tech bathtubs that will get you dreaming of that nice, long, hot soak. Home Chunk recently posted a list of the most high tech bathtubs you can find in the market, and boy, are they drool-worthy! Sure, some of them are jacuzzis, but who says you can’t have a jacuzzi as your bathtub? Of all the high tech bathtubs listed, there are two I would consider buying IF I ever win the lottery and have some cash to spare. Check this out. This is called the Cosmo Hydromassage TV Bathtub, and it already got me just by the name alone. I can’t count the number of jets – both air and water – included in the tub, and that is enough to make me want to soak. There is, of course, the TVwhich means you can catch up on your favorite show/series if your schedule is too hectic. Talk about the convenience! This Nirvana Bathtub is a little dreamier, though not less high tech. 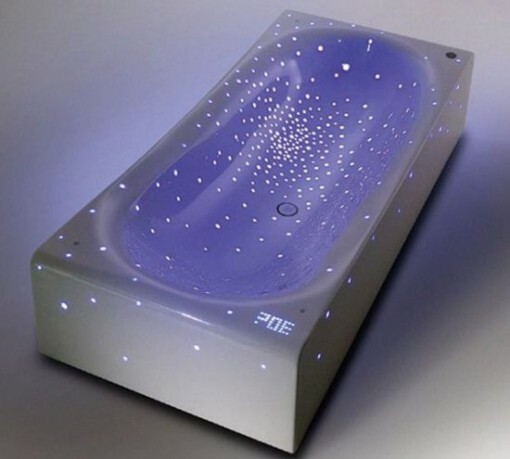 The main thing about this high tech bathtub is the fact that it gives you a sense of bathing among the stars, thanks to LEDs scattered on the surface. See more at Home Chunk.